Theitic is a notable member of the occult community. He became editor;publisher of The Witches' Almanac Ltd. upon the death of founder Elizabeth Pepper in 2005. One reviewer cited alleged Christian stuff in the Almanac. So I went and looked at what she cited as evidence, because I am all for avoiding Christian references in pagan or witchcraft works. But they just do not occur in this almanac. The first the reviewer gives as evidence of supposed Christianity in the Almanac is a quote from the book by Leland (of Aradia fame), wherein a witch in 1900 gives a retelling of the story from the book of Enoch (NOT a Christian text) about the Watchers and how they taught humans various arts and married some of them. The witch quoted translates the Watchers into the Fae and spins it as British folk belief. But it is simply the story from Enoch retold from the perspective of British folk belief. It's not Christian. The next example of alleged Christianity in the Almanac that the reviewer quotes is an article about marijuana that contains a reference to Rastafarians smoking marijuana to get closer to God. This is not exactly Christian agit prop, and that is as close as the article gets to anything Christian even in passing. The final example of supposed Christianity in the Almanac is a page discussing the Star card that came from Paul Huson's book on tarot. He says that some decks depicted the Star as the star of Bethlehem. That's a historical fact, not an assertion of Christianity. And that's all that is said about it. As for there being nothing about familiars, there's an entire article about familiars in there. There are also many articles about animals as they appear in folklore, in astrology, in paganism, in witchcraft, etc. Plenty for the witch's soul here. 1.0 out of 5 starsAre we witches or aspiring Christians? Where's the familiars? What an extreme disappointment. Not even 30 pages in and I can't fathom reading any more of these excerpts depicting the Lord and father as our creator and the tarot being symbolic of the birth of Jesus.... Umm WITCHES almanac? We believe in the balance of the feminine and masculine divinities, but our lean is feminine. Especially in terms of creation. Not to mention, this test is supposed to have something to do with familiars and friends and I have yet to read anything on the topic. The closest mention to anything even related to familiars was an excerpt by Ivo Dominguez on page 21 which discussed the spirituality of animals. Honestly, I only get this book anymore for the calendars and horoscope, but even the horoscope seems to get weaker every year in detail. 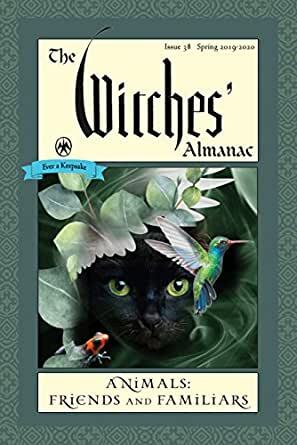 At this rate, I can purchase the witches daily planner and get as much useful info and more with material and excerpts that are at least Pagan and Witch focused. Or did we forget who pushed paganism out of our lives to begin with. To each their own, but the witches have been done an injustice in the development of our practice to be more inclusive to Christianity and have only intern adopted the practices of Christianity. Soooo why call yourself a witch? Did you hear that you can make it whatever you want? Sure, you can... But if you miss the point of a witches beliefs then just call yourself an agnostic. That is more likely what you were looking for when you thought you'd give being a witch a try. I don't know if I can keep purchasing this. The Witches' Almanac has always been a great source of information and the contributors are expert occultists, magicians, and witches. There's a one star review here recommending some other obscure almanac. The criticism of this review is that the Witches Almanac is somehow pandering to Christian inclusivity. Out of the 208 pages, the reviewer takes a picture of three pages with three quick mentions of monotheistic history or lore, as in single sentences, to prove their case. Paul Huson mentions that the Star card is related to the Star of Bethlehem. Anyone who knows anything of the Tarot knows that the tarot (particularly the Marseilles deck which predates Rider-Waite-Smith) was strongly influenced by the Christian religion and based on religious parades called Triumphs or Trumphs in Medieval Times, which is where we get the name "Trumps" for the Major Arcana before we had the term Major Arcana. The idea that someone is accusing Paul Huson of not only being a witch but pandering to Christianity is the most laughable thing I've ever heard at best and offensive to him as a Pagan Elder. PAUL HUSON! Pick up a copy of his classic Mastering Witchcraft and you will QUICKLY see that Huson is far from promoting Christianity in Witchcraft. The reviewer posts a picture mentioning Rastafari beliefs in the Bible. What the reviewer neglects is that it's one line in a long history that Ellen is laying out regarding the religious and spiritual history of marijuana. She goes over Chinese, Egyptian, Indian, African, Japanese, Taoist, Korean history and much more. Ellen Evert Hopman is a druid. There's no way that she's promoting Christianity in her article. The last picture the reviewer posts is an excerpt from the classic "The Witchcraft of Dame Darrel of York" by folklorist Charles Leland. Leland was perhaps the largest influence on Modern Witchcraft, particularly his "Aradia: Gospel of the Witches" which deeply influenced Gerald Gardner and his Wicca. The fact that Leland talks about "The Father Creating" while talking about the origin of faeries, isn't a promotion of Christianity. Leland is a folklorist and anyone who knows the tiniest bit of the old faery faith and its history knows that there's a long Christian influence in those beliefs, just as there is Witchcraft whether we want to rewrite history or not to exclude it. The reviewer claims there's only ONE article about familiars. That's absolutely not true. Just skimming through the book there's AT LEAST 21 ARTICLES related to familiar spirits both as animals and as non-animal spirit companions (as per the traditional view). In other words, the one star review is bunk and the person doesn't know what they're talking about or much about witchcraft at all. Arguing against the antique writings of Charles Leland, the writings of the influential witch Paul Huson, and the druid Ellen Hopman as somehow pushing a Christian agenda is absolutely ludicrous. 5.0 out of 5 starsMany thoughtful articles, timely. I was impressed by the articles and the timeliness of the issue. (My friend, the Goddess Bastet, is assisting me in making a familiar of my ghost cat this week.) There's some thoughtful stuff in this one, if you have a familiar or are thinking of obtaining one, might be worth it to pick up a copy. I buy one every year and keep them in my library. There is a lot of nice information that you can use from year to year thanks to the way they change the focus of the content. Great series for any Witch.